Larvae of crane flies often have brownish, tough, pliable skins, giving them the name "leatherjacket." Adult craneflies look like gangly, giant mosquitoes, but they don't bite or sting. Crane flies prefer moist terrestrial or aquatic habitats. Many species of crane flies live throughout the United States, but the kinds known to damage or kill lawns are two species introduced from Europe, the European crane fly and the common crane fly. 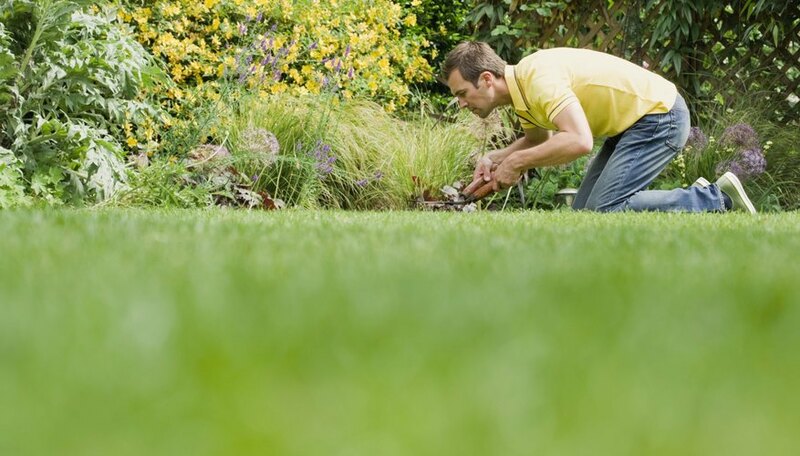 Healthy lawns can usually tolerate a low level of infestation. Track population levels to see when pesticide use is warranted. If you live in certain areas of the United States, your lawn can harbor potentially damaging leatherjackets. The European crane fly (Tipula paludosa) now inhabits New York, eastern Canada and the Pacific Northwest. The common crane fly (Tipula oleracea) ranges from Northern California to British Columbia and also occurs in New York. If you live in areas outside the known range of these crane flies, your lawn damage is most likely due to another cause. To reduce populations of crane flies, withhold irrigation during the fall when adult flies lay eggs in the turf. Hatching young larvae can't withstand dry conditions. In the spring, soak an area of the lawn and cover it with a tarp. Larvae come to the top to escape the excessive moisture. Remove the tarp and collect and destroy the leatherjackets. Also rake the lawn at night to gather leatherjackets that come to the surface to feed. Look for European crane fly larvae in the fall and common crane fly larvae in both spring and fall. Take lawn samples 1 to 2 inches deep and 6 inches square. Count the leatherjackets and multiply the number found times 4 to find the larvae per square foot. In research done in Washington state, the threshold at which treatment was recommended was 25 to 50 larvae per square foot. The University of California recommends treating with carbaryl at the rate of 3.673 ounces per 1,000 square feet. The New York Invasive Species Clearinghouse advises checking with your local extension specialist about using imidacloprid, trichlorfon and chlorpyrifos. Ohio State University mentions bifenthrin and lambda-cyhalothrin for leatherjacket lawn care treatments. Bifenthrin manufacturer FMC Corp. advises one annual spring or fall application of 4.6 pounds of granular bifenthrin per 1,000 square feet for leatherjackets. A nematode, Steinernema feltiae, is a biological control agent for leatherjackets in the Northwest. Apply nematode larvae at the rate of 25 million larvae per 1,000 square feet to irrigated soil in spring when temperatures reach 55 degrees Fahrenheit. The University of California estimates 50 percent leatherjacket population control is possible with nematode use. An insect-killing fungus, Beauveria bassiana, is a biological control agent in New York state. Natural predators such as birds and predacious beetle larvae can help with leatherjacket control. State of Maine: Crane Flies and Leatherjackets -- Tipula Spp.